Top Loader and Front Loader Washing Machines: Which Cleans Better? Doing laundry is probably one of the most taxing and time-consuming household duties. There are so many things to keep track of while using washing machines. Honestly, it’s a hassle, and socks always seem to disappear. But can you imagine having to do laundry without a washing machine? However, even if you are going to a laundromat or using a washing machine provided by where you live, washing your clothes can be an all-day event. Having a washing machine in your home adds an infinite amount of convenience. It can make washing your clothes a much more efficient chore. But not all washing machines are the same. Let’s take a look at which washing machine is best for your needs. Growing up it is likely that if you had a washing machine in your home it was a top loader with a big agitator post going right up the middle. If you are like me you almost had to climb inside the machine when you learned to do your own laundry. The washing machine was so tall it was hard to get the clothes out. Top loading washing machines were pretty much the only in home options back then. They are still pretty popular even today, but we have a lot of different, better options now. There are front load washing machines and HE (high efficiency) washing machines that are both front and top load as well. I’ll break down what each one means, and the benefits of each so that you can determine which is the right fit for you. You’ll see two different types of top loading washing machines on the market these days. There are those with central agitators and HE models that do not have agitators. The agitator post that runs up the middle of the washing machine serves to mix your laundry and keep it moving around during the washing cycle. Some of them are even dual action. That means the top half spins circles and has a spiral paddle shape that keeps your clothes from floating to the top. The paddles prevent your clothes from not getting submerged that way. This is a great feature that worked well for years, but it can be really hard on your clothes. The agitator stretches and puts a lot of tension and pulling on the fibers of your clothes. As you can imagine, this isn’t great for your clothing. The high-efficiency top load washers, on the other hand, don’t have an agitator, but they have an impeller. An impeller keeps the water spinning and the washing machine’s drum keeps the water spinning. Impellers are shorter and don’t’ catch your clothes. They also use the water to keep them spinning and the fibers on your clothes do not get stretched. While they are short, they still have paddles and may catch longer items like towels or bedding. Front loading washing machines are much easier on your clothing because they don’t have an agitator. Instead, their drum spins to stir your clothes and keep them moving. The drum is lined with vanes and bumps that give your clothes the necessary kneading to get them clean while also doing minimal damage. Front load washing machines also use a lot less water. Standard top load washing machines have to suspend their clothes in enough water. Front loaders do not. 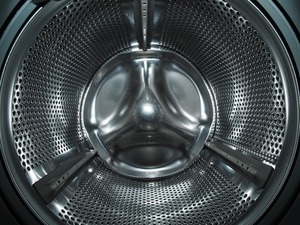 Front load washing machines use gravity to keep clothes moving. The gravity allows the clothes to get fully saturated in a shallow pool of water. It only takes about 14 gallons on average for a regular load. A top loader will use almost an average of 20 gallons of water per wash. While front load washing machines do provide a good amount of water waste reduction, not all of them are at the best standard. If you want a washing machine that really conserves water, check for an Energy Star label. This will be really hard to find any washing machine that has the Energy Star label that isn’t a front load washing machine. They are just much more efficient in water usage and energy usage. Because I will be comparing the two, I will just list the positives about each. The positives about either will outline the less positive aspects of the other. Top load washing machines are a little bit easier to use than front load washers. You don’t have to bend over to load your clothes. The top does not lock so you can add more clothes mid-cycle. No more missing one sock! You can also distribute fabric softener and other additives better than a front-load washing machine. A top load washing machine also finishes cycles faster than a front load washing machine, especially if it has an agitator. However, without an agitator, you can fit more clothes into the machine and it is easier on your clothing. There is a little less maintenance when you choose a top load washing machine because front load machines, with their sealing doors, tend to grow mold if left unwashed. Front load washing machines can be more convenient for someone who is wheelchair bound or old because they won’t need to lean into the top load to get their clothes out. A front load washing machine gives you a better clean for your clothes and it is much easier on the fabric. If you are limited on space, front loader washing machines are the best option for you. They are conveniently stackable. It is a great way to save space when you have limited room in an apartment. It also makes it so that putting clothes into the dryer is much more convenient. Front load washing machines spin more quickly, which means they will dry more completely when they are put into the dryer. This can cut down on the amount of time needed to dry your clothes and can save you time and money. Having a washer in your home is great. Whether you do a little bit of laundry for yourself, or you are doing laundry for a whole family, having a personal washing machine can save you more time than almost anything. A front load washing machine may cost a bit more money up front, but it saves you time and money, making up for the costs up front. They will also clean your clothes better and help your clothes last longer. However, the top load washing machine may be more in your price range right now. A classic washing machine with an agitator has a good chance of lasting longer as well. That means more costs in water and electric for a longer period of time. Considering what is best for you is important, but it will never be a bad idea to invest in a washing machine and dryer because it will provide for you more time for your, or your family.